T.A.T.A Seattle Conducted Food drive for The Sophia way (homeless shelter for women). We have received good response from the T.A.T.A Seattle community. T.A.T.A volunteers went to The Sophia Way on March 21st at 5pm and donated the essentials needed by the shelter like Coffee, Tea, Sugar, Salad dressing, Breads, Frozen vegetables, juices and more nonperishable food. 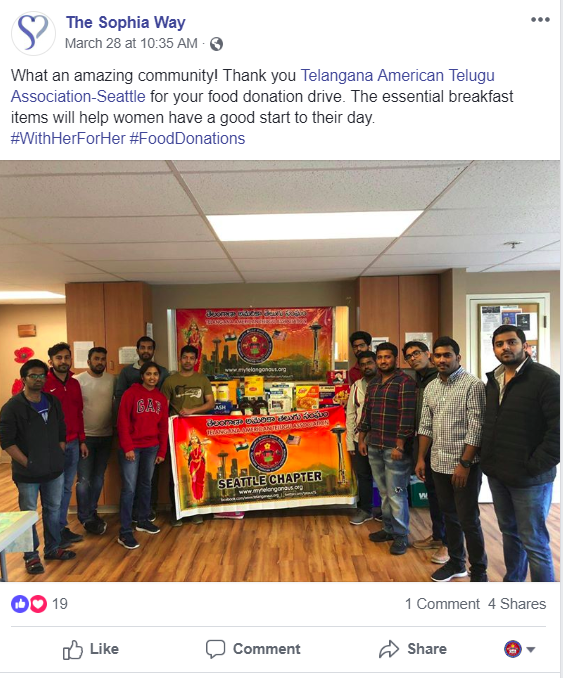 With the help of generous donors and the Telangana community, we are looking forward to conducting more community service activities near future. Thank you volunteers, participated in this event. T.A.T.A USA strongly believes that "Giving is not just about make a donation, it’s about making a difference". The Sophia way provides breakfast and lunch to Day Center, and dinner and breakfast to the women in their Night Shelter Program. They also provide dinner and breakfast to the women at the Eastside Emergency Shelter.